Panoramic views of Hamburg, soundproofed rooms with stylish décor, free Wi-Fi and a 24-hour bar are offered by this non-smoking hotel. Lohmühlenstraße Underground Station is just 50 metres away. 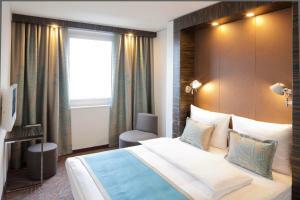 The air-conditioned rooms at the Motel One Hamburg-Alster feature a flat-screen TV and elegant lamps. Each bathroom has a striking glass and granite design. The 24-hour One Lounge is used as a lobby, bar, and breakfast room. Varied buffet breakfasts can be enjoyed here or outside on the terrace. Trains run from Lohmühlenstraße Underground Station to Hamburg Central Station in just 2 minutes. Underground parking is available at the Hamburg-Alster Motel One. The Deutsches Schauspielhaus Theatre and Außenalster Lake are less than 1 km from the Motel One. All children aged 7 or older staying in their parents' room are charged for breakfast (see Hotel Policies). Please note that extra beds are not available for children over 12 year, however some rooms are available with connecting doors.